The shot was taken at an old New York club called Hurrah's (70's to mid 90's?) that was a mid-size place. I remember seeing New Order there the same year. As I recall, Ollie was playing a bashed up Gibson Melody Maker [Les Paul Junior - Ed.] 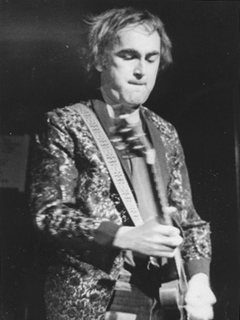 and I think he also played a white Fender Stratocaster at some point (although the evening is now a blur). It was the only time I ever saw him. 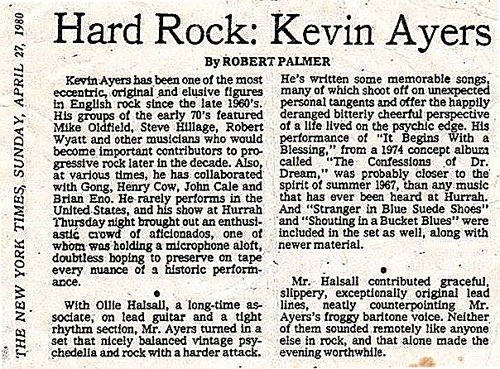 I just happened to be in New York that weekend and looked through The Village Voice to see who was playing and there was a little advert for Kevin Ayers. I wasn't really a fan but remembered that Halsall was on an album of his that a friend had. I dragged another friend (a very accomplished New York jazz guitarist whose name I will not drop) to the show. I kept telling him "you have to see this guy - he's changing the way the electric guitar is played". Halsall did little to impress for the first three or four songs and then suddenly - at a seemingly inopportune moment - unleashed a flurry of notes that literally stunned the crowd into silence. I remember the shocked look on my friends face as he realized how good this guy was. Afterwards he said to me that he was going to chuck the guitar (he didn't). 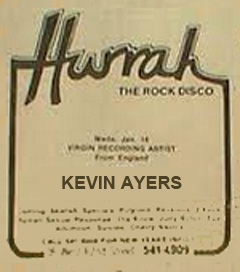 A great night as I recall, with a receptive crowd and I even ended up liking Ayers after that! I hadn't thought of Halsall for a long while until I came upon the photo with a bunch of old ticket stubs (sadly, not the one for this gig) and thought I'd google him to see if he had been completely forgotten.